Some of you may have noticed we have a new modly face popping up and seizing control of all things Kadic and Election related As resident forevermods jym and myself often find ourselves bogged down by the trappings of the (shudder) real world, and any semblance of pride I had over being one of two super special megalomaniacal mods dissolved with my limited interaction with the forum, it's time to entrust a new set of members with modliness. A lot of you may have noticed that a certain someone is the champion spearheading the Kadic Elections effort with Soul Jelly. We are proud to announce officially that he is a mod, right up there with us. He has been a part of this community for a very long time and I personally respect him a lot as well as his efforts to contribute to pretty much ever incarnation of the forum. He shows excellent judgement and an unmatched drive for action that will greatly benefit the community and himself in the future. Congratulations to Starke on his well-deserved title and may he wield his powers with grace over all! That's not all, however. 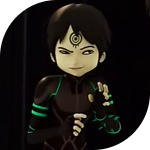 We have another new mod lurking in the shadows... a member who has shown an awesome dedication to the heart and soul of Code Lyoko itself. She has lead and been a part of several projects, some that have involved our forum and some that span many other forms of social networking. Her appreciation for Code Lyoko and its native tongue spans international lines, and she puts forth a tremendous amount of effort wherever it's needed. Whether that need is moderating, translating, or organizing the latest effort to bring Code Lyoko to people all over the world, we are proud to have LaserArrow as our second new mod!